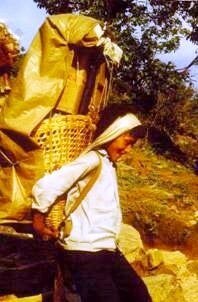 The parents of our children in the mountains are small farmers belonging to the Tibetan speaking Sherpa people. They are Buddhists. Their forefathers migrated from eastern Tibet to the valleys south of Mount Everest around five hundred years ago. Their home is now the north-east of Nepal, adjacent to Tibet. Together with their caravans of yaks they used to travel north to transport rice and spices from the valleys in the south to Tibet's inhospitable high plateau. On the return journey the animals were laden with salt, wool and dried meat: goods which even today are in great demand in Nepal. The Chinese occupation of Tibet has interrupted this trade. The Sherpa live in small villages and isolated hamlets on the southern slopes of the highest mountain range on earth, the Himalaya. 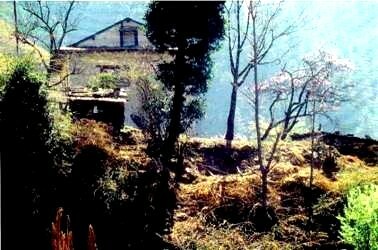 Their small farms are situated at altitudes between 6,000 and 9,000 feet above sea level (2,000 to 3,000 metres). 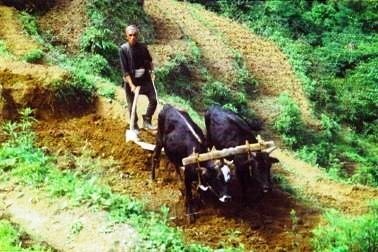 Their fields are on man-made terraces or on the more gentle hill slopes. They grow wheat, potatoes, and vegetables for their own use. In the summer months one or two members of the family take the animals up to the high mountain pastures, where, at an altitude of 12,000 to 14,500 feet (4,000 to 4,500 metres), they look after their yaks and cattle until the end of August. In the trekking season some of our children's fathers and elder brothers work as guides for trekking tourists or in expeditions. But only very few are lucky enough to find this kind of employment. Hardly any of the fathers and only one of the mothers of our children can read or write. Until a generation ago these skills were a privilege reserved for the monks. Even today not all of a family's children are allowed to go to school. Girls are often taken out of school again after two or three years as their help is needed at home. This boy comes from a very poor family background. He has to contribute to the family's income by working as a porter. His dream of education will never come true. Our children are well aware that an opportunity to get school education is a valuable chance. Some even come on their own initiative as teenagers to attend the first and second classes with their younger brothers and sisters. As hardly any families are in a position to afford sending their children to boarding school we ask you to sponsor a child so that these children and young people can get the education they long for. 20 Euro only per month are needed to send a child to school in Phugmoche: that includes teaching, board and lodgings.